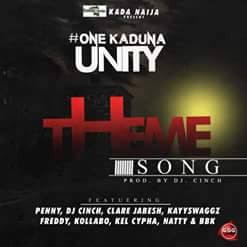 #OneKaduna unity song promotes unity in Kaduna.. this is the theme song for the #OneKaduna Unity Concert scheduled to hold on the 8th January 2017 at MG Grand Garden(palm palace) Ungwan Boro, Sabo Kaduna.. This song features DJ Cinch, Kollabo, BBK, Penny, Natty, Clare Jabesh, Freddy, Kel Cypha. The song and event is brought to you by Kada Naija.